Oxford Holiday Accommodation: During the University holidays, the Oxford Chaplaincy offers reasonable self-catering holiday accommodation to students and academics who wish to stay in Oxford out of term. Select the dates you wish to stay in Oxford or click 'Availability' on each room type; Modern, Traditional or 'Cave'. Looking for Oxford University Holiday Accommodation? 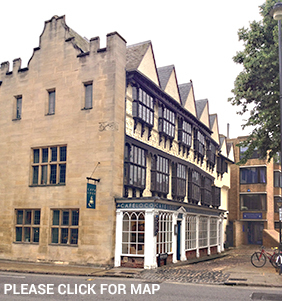 The Catholic Chaplaincy offers low-cost holiday accommodation in the heart of Oxford with plenty of shops and restaurants nearby. Each resident has access to the student kitchen and dining room. Data Protection Policy. The Oxford Catholic Chaplaincy’s approach to the protection of personal data is consistent with that of Oxford University. The statement relating to this can be found on the Chaplaincy website. We only process information connected with accommodation at the Chaplaincy, and matters relating to the pastoral care of staff and students at their request.